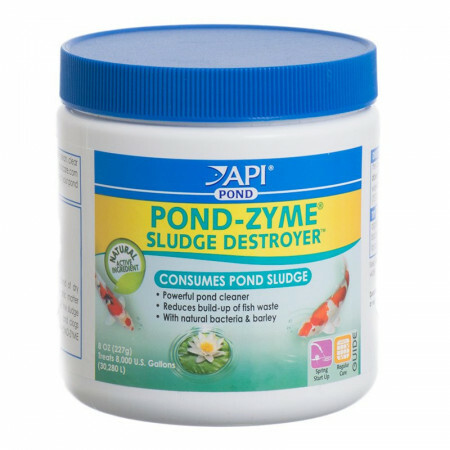 API Pond Pond-Zyme is a heavy-duty pond cleaner, containing five specially selected bacterial strains in a stable dry form. Pond-Zyme breaks down fish waste and dead algae that can cause cloudy water, sludge build-up, and debris that clogs pumps and filters. Pond-Zyme can be used in all ornamental koi ponds and water gardens, works in both cold and warm water and may be used during spring start-up and for regular care. Pond-Zyme is a 100% natural product and is safe for all pond fish, plants and wildlife. 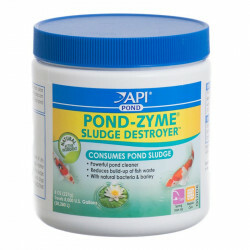 Pond-Zyme is a super-concentrated blend of dry bacteria and natural barley that keeps pond water clean and clear. Organic matter accumulates in all garden ponds, forming unsightly sludge. As the sludge decomposes, it consumes oxygen, degrades water quality, and clogs pumps and filters. It is also a breeding ground for fish pathogens. The specially selected bacterial strains in Pond-Zyme work quickly to remove sludge build-up. Directions: Use the enclosed measuring spoon and sprinkle evenly around the perimeter of the pond. For best results, use Pond-Zyme with API PondCare Accu-Clear, a two-step approach for incomparable water clarity. Spring Start-up / End of Season: Add two scoops per 200 US gallons of pond water (757 L) twice a week for 2 weeks. 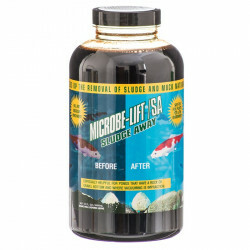 Maintenance: Add one scoop per 200 US gallons (757 L) every 2 weeks. Note: Formerly known as PondCare PondZyme with Barley. I have a 300 gallon koi pond, with an over-sized biological filter system. The raccoons got the koi, so now it's a goldfish pond, but they are very happy goldfish, multiplying each year. Without the Pondzyme, the natural bacteria and enzymes just don't work well enough, and I end up cleaning it all out every three months or so (messy). With the Pondzyme, there's far less sludge, and I can actually go for a year without a problem, This is good stuff! My pond was murkier than it's ever been. Between the products Pond Zyme and Tetra algicide the clarity improved significantly after two applications. So much so I was able to see we had over 50 baby fish of different ages!! Thanks Pet Mountain, your prices were fantastic as well. Cleared the "mung" and string algae after 2 applications. Great product. Been using it for a long time and it does the job every time. Keeps the water clear and sparkling! I've tried variations of this product and I have always come back to this one. I won't use the other products anymore. 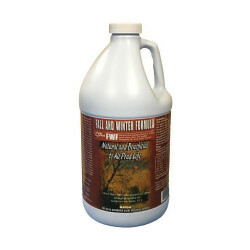 I purchased this product last fall started using it this year! Spring is early here in Florida, I am so satisfied with Pond Zyme, I wanted to purchase more and all is sold out. It doesn't take long for the word to get out, try it its great. happy pond keeping. 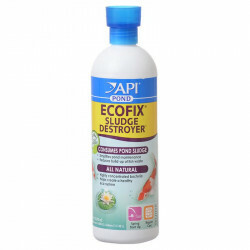 This is the most awesome product I have used in my Koi pond. Within weeks, the sludge, and algae broke down, leaving crystal clear water. My filter and skimmer worked overtime collecting the debris. I will never be without PONDCARE POND-ZYME with Barley! I've been using Jungle Pond products now for over 3 years. I've also tried some other brands in the last 21 years, but Jungle Pond Clear-Zyme is the best product I've ever use in my Koi pond to keep the water clear and free from sludge build up.